Home by the skin of my teeth, having taken a notion to take the Wednesday boat north rather than the Friday one I was booked on. And just as well, given that all NorthLink sailings between Aberdeen and Shetland were cancelled on Thursday and Friday, due to the appalling weather. I was aboard the Hrossey, along with a Volvo estate packed to the gunnels with bargain beer, biscuits, carpets, wine and paint, arriving at 7.25 on Thursday morning. And that was the last freight or passenger boat to get into Shetland until....well, I'm guessing some time on Sunday. Which means there will be damn all on the supermarket shelves. Still, we have the beer, wine and biscuits. I was just settling into my premier-cru cabin (free chocolates, water, coffee and telly) on Wednesday night when my Voicemail went off. It was Susan, a crackly message from the roadside between Brae and Hillswick. "Now, I don't want you to panic, I'm all right, but..." Good grief. In February, Susan was seriously injured in a head-on accident on the main road between Lerwick and Brae. The driver who hit her was killed. Susan was driving a long wheelbase Land Rover Defender which was destroyed. Every single alloy wheel was shattered and the vehicle itself bent, its front end totalled. The strength of the Defender's beam chassis probably saved Susan's life, but the primitive interior (no airbags) caused a skull fracture and numerous other lesser injuries. I'm not going to dwell on that night. Suffice to say that Susan has staged a remarkable recovery, returned to driving quickly and with no ill effects, insisting on a replacement car that was as substantial as the Defender, but fitted with airbags. An imbecilic or deliberately obstructive insurance company meant we didn't (still don't) have the money for anything equivalent, so I picked up an old Jeep Grand Cherokee (with typical American full-on safety equipment) from eBay. Thirsty, but comfortable, rugged and airbagged to the hilt. And that, on Wednesday evening, was what Susan was driving when she was hit, yet again, head on, by a driver overtaking another car. Again, it was a high-speed collision. This time, thank God, no-one was seriously hurt (Susan, alone in the car, suffered whiplash and bruising). The Jeep, which had just been the subject of a loving restoration, was comprehensively smashed. But the Grand Cherokee, despite being nine years old, is a much more modern design than the essentially 1950s Land Rover. It crumpled everywhere but the passenger compartment, all the airbags went off, and Susan was able to step out, unutterably furious at the loss of a car she had grown to love. This was what I was not supposed to panic over. Anyway, I'm back, she's OK - a bit shocked and sore - and this morning I went to Jim's Garage, who recovered the wreck, to look at the Jeep and retrieve some belongings. And, just as I almost cried when I saw that crushed and broken Land Rover, I felt tears prickle at my eyes when I saw the Jeep, broken open to the elements, those lovely leather seats all wet. And I have to say, as someone who loves cars and motorbikes, who has been infatuated with the internal combustion engine since I was old enough to enunciate my first words ("T'iumph 'Enown" apparently), I am suddenly so sickened with speed, with the celebration of it. And especially with the moronic, thick-ear posturing you get on the likes of Top Gear. I am nauseated by the kind of person who jokes about Land Rovers not needing airbags - "we have other cars", is the punchline, comedy fans. I have the kids with me today in the old Volvo (no airbags) and I am driving....well, I'm driving with the implications of speed, of collision, in my head. Always. Must stop now. There are children to collect, there is shopping to do, if I can find anything in the Co-op to buy. And I'm going to take it easy on the way home. Apologies for the absence of new postings, and especially photographs. I have, however, been snapping furiously with my Sony Ericsson pile-of-crap cameraphone (useless, useless keyboard for anyone with normal size hands) and some of those pictures should make their way here soon. Currently in Aberdeen, following four days in frostbitten Glasgow. Good grief, it was cold, and I was two days into staying at my hotel of choice (another of the large selection of cheap lodgings available in the Sandyford/Finnieston interface) before I realised the heater could be turned up and there were spare blankets in the cupboard. Great area for bars, cafes and restaurants, the Argyle St/Sauchiehall St/Kelvingrove Park triangle, and there are clear signs that the whole area is on the up and up, property-wise. While the breakfast at The Sandyford Hotel (£35 a night, full Scottish) was pretty good, I liked to head for Beanscene and slurp down an expensive bagel with cream cheese, a latte and a muffin over the papers. Nearby are the proven delights of the Ben Nevis,Mother India (and the associated cafe) Fanny Trollope's bistro, Air Organic, Sisters,The Buttery (bit of a dodgy walk for some) Firebird, The Goat, Stereo, Cafe India and some other, newish places I haven't tried. One place I was absolutely determined to eat in, though was Kokuryo, Scotland's first Korean restaurant, which has received rave reviews. And so, on Saturday, that was where I found myself, eating unidentified things and realising that Korean food seems to increase its spiciness as you move through the various 'courses'. It was tremendously good. For £12.99 you get three courses, including an unlimited buffet which in its freshness is a world away from the Chinese all-you-can-eat buffets you may be used to. The starters - including miso soup, tempura veg, sushi and barbecued king prawns - were superb, though it must be said that the Korean beer - called Ob - was pretty much modelled on American Budweiser and thus not particularly challenging. Pudding was beautifully-modelled (carved) fresh fruit, the staff were friendly and keen to educate in the abstruse elements of Korean cookery, and all in all it was an exciting business, encountering a new cuisine. Afterwards we walked along to King Tuts to see Kathleen Edwards and her band, who were excellent - alas, I only caught one song from the support, Joel Plaskett, but it was so good I bought his album La Di Da. King Tut's is truly a magnificent venue. And air conditioning, even on such a freezing night, proved a fantastic asset. Though some regulars bemoan the absence of the old sweaty ambience. Last night, though, I was back in Aberdeen and to my eternal culinary shame partook of a Big Mac with large fries. My excuse? I was starving, there's a McDonalds at Asda, and....oh, never mind. I felt great for approximately ten minutes after consuming this monstrosity, then progressively bloated, sick and finally, within two hours, hungry again. I staved off the pangs by going to see, at long last, the Jim Jarmusch movie Broken Flowers ( Not as good as, say Mystery Train or Night on Earth, but like all Jarmusch films, it haunts you), then filled up on apples and a bar of Turkish Delight I found hidden in my briefcase. After which I had the most violently filmic dreams I've experienced in decades. Imagine a cross between The Matrix and Saving Private Ryan. Or on the other hand, don't. Stage one is INDIVIDUALISM: either as a working hack or some sort of pundit, you are identified as having something to say and the stylistic arsenal to say it well. So you get a column. Stage two is ECCENTRICITY: Loveable, preferably, but the whiff of sulphurous, ranting rancour can have its appeal. You're special, some readers turn first to your outpourings. Alas, you're beginning to appreciate your own specialness a tad too much. Stage three is EGOCENTRICITY: You've never been that easy a person to deal with; now you start making whimsical decisions about content, attacking sub-editors physically and in print should they mess with your deathless prose, demanding serious Adobe Photoshop work on your byline picture and crucially, more money. Amazingly, your needs are pandered to. Stage four is UBIQUITY: The occasional request to review the papers on radio has turned into a flood. You now won't go anywhere near a radio studio without taxis being booked by the hapless researcher, and a substantial fee agreed with your recently-acquired agent. You are affectionately known to said researcher and colleagues as "a gob on a stick", a "media tart" or far worse. TV projects are discussed with dozens of independent production companies. One gets commissioned. You get your teeth fixed, go on a diet and consider using Botox and/or Regaine. Stage five is NARCISSISM: You are supremely confident that all your readers want to know about is you and your opinions. You write about how the world impinges on you, and you rejoice in the certainty that you are not only right on every subject, but that even the smallest details of your experience are worth writing about. In fact, your eye for detail is, you feel, one of your great strengths. You bought a pencil the other day - what a wonderful sensation it was, the graphite slipping silkily over hand-made paper. You break up with your wife and abandon your children - how movingly you describe the sensation of being alone, then of pursuing and wooing a lissome 19-year old coke fiend model/singer/DJ. How beautifully you analyse your inner turmoil, confident that thousands of men will identify with you, and thousands of women want to sympathy-shag you. Only you matter. It's your duty as a columnist, your duty to your readers, to tell all. All about you. And if others suffer by their portrayal in your column - well, didn't Graham Greene say that every true writer has a chip of ice in their heart? And you are a true writer. Oh yes. Stage six is SOLIPSISM: Really, there's not much point in writing about anyone or anything else but yourself and how you feel about yourself. That's what people are buying the newspaper for. Not that you read it, apart from your own column. Strange how those telly and radio invitations have begun drying up. You've stopped going out. Food gets delivered. The lady who does has stopped doing. The editor keeps wanting to talk to you, but you never return his calls on principle. Stage seven is ONANISM: This is really the fulfilment of a condition which has been developing since stage three. You keep writing your column, but unknown to you, it's no longer published. You never see the paper, don't do anything but eBay on the net, don't check your bank statements. Finally, the house is repossessed, you're declared bankrupt and you end up selling the Big Issue and sleeping in a hostel. Stage eight is REDEMPTION: you start blogging, using an internet cafe; Canongate offer you a book deal. Your memoir ("Hacked Off") is a worldwide success. George Clooney buys the film rights. You get offered a column, but you insist that blogging is the future. You move to tax-free Ireland and die of cirrhosis. To provide for your family (you've spent all your royalties on Powers and Murphys) you agree to write one last series of columns, and your terminal decline is described weekly in a column called "Liverish". It gains your highest readership yet, considering it is published only in the Caithness Courier. Stage nine: HALLUCINATION. It was all a daydream. Too much absinthe at breakfast. There's still the SWRI reports and the fish prices to do. Fire up that Amstrad 8256, mate! Get to work! The end of the columnist? Journalism is like blogging, only you get paid. Though my Google Adsense feature has made me, oh, seven of your US dollars in the past three, err...months. I used to be a journalist, and on occasion still am. I have been a regular columnist, paid (sometimes handsomely) for The Scotsman, The SundayHerald, Scotland on Sunday, the Daily and Sunday Express, South African Sunday Life, Big Issue in Scotland, Northwords Magazine, New Statesman Scotland and several more I have conveniently forgotten. And the Shetland Times. My last vestige of weekly columnisation was dispensed with this week, following the final, somewhat abrupt demise of Nippy Sweetie in the Shetland Times, my local paper. Check out the archive here...and note - the column was not dropped, and my stopping has nothing to do with the imminent arrival of a new editor. It's more like a combination of sheer laziness and a desire to rationalise my activities. A daily radio show, two weekly national cartoon scripts, frenzied restoration of a house and family life is enough for the moment, I think. However, we don't have to deal with sub-editors. A good thing. Mostly. But then you end up revising and polishing, not to mention removing actionable items, day after day after day...for example, the notion that Gillian Glover was among those leaving. It seems she's not. 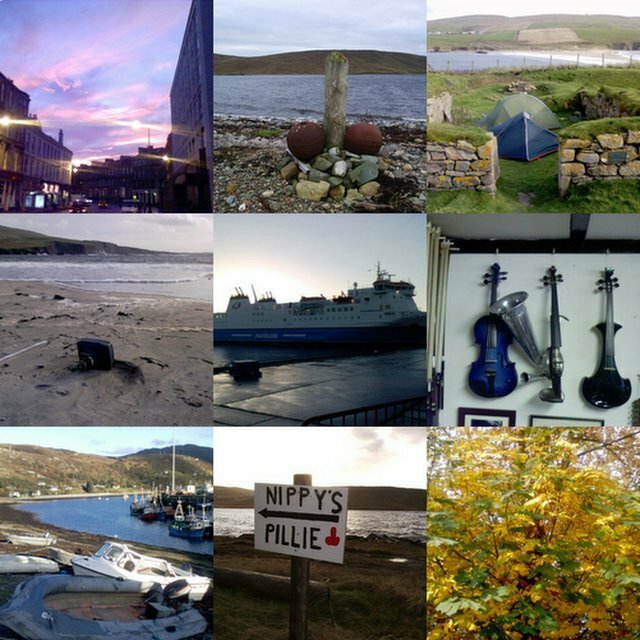 Variously: Dawn over Glasgow; the Assater Pillie; bizarre camping within the ruined St Ninian's Isle kirk; Stroh and Skynbow fiddles at the Violin Shop, Glasgow (we came away with a double bass and a cello); telly on the beach; the north boat, or one of them; Ullapool; sign of the Pillie-obsessed times; a tree. ...I took this just after daybreak during my last visit to Glasgow, a week ago. I'd just come out of my hotel (the Devoncove - cheap, cheerful and not very clean) on Sauchiehall Street, in my favourite part of the west end - where Kelvingrove Park interfaces with Finniston, along from Mother India. 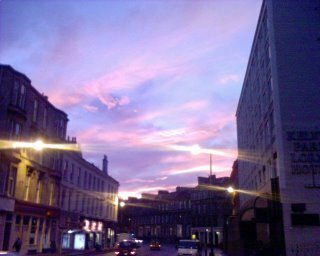 The camera phone I was using (a Sony Ericsson V600i, free with my last contract) just about captures, amazingly, the shocking bluey pinkness of the dawn. Immediately afterwards, I took my hire car back to Arnold Clark, where a man called George informed me I would be charged an extra sixty quid because one front tyre was soft. Turned out there was a nail in it. Nothing would change his mind. Insurance doesn't cover punctures, it seems. Won't be using them again. A pity, as I've been using Arnold Clark in Vinicombe Street for nigh on...well. A long time. Worst summer in 40 years, best October in 20. Or so a local fisherman told me yesterday in the newly refurbished Brae Garage, which is now a shop, off licence and general impersonation of the Tardis, complete with computerised flight deck. Brae is the nearest sizeable village to our humble hamlet, some 10 miles away towards the Sullom Voe Oil Terminal (the biggest in Europe). And in Brae you can get petrol, LPG ( I have an old gas-fired Volvo and Susan's getting her Jeep Cherokee converted even as we speak) fresh-baked frozen French bread and the papers. Or as they say hereaboots, da peppers. In Brae you can also get a decent meal, a pint, have a swim, a sauna or go to the gym, and there's a six-year secondary school too. Not to mention a brand-new health centre the size of Wick, and a residential care centre for elderly folk, including my mother-in-law. 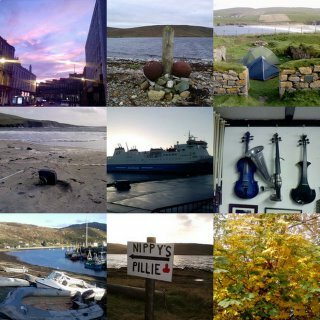 Oil money makes Shetland the last remnant in the UK of the late lamented welfare state. And we're grateful, don't think we're not. Anyway, glorious October is over, and while November has come in similar shining splendour, I could see a big nasty front approaching from the south east as darkness arrived this afternoon. The clocks have gone back, soon it'll be dark at 3.00pm or earlier, and it's the season of peat fires, home brew, music making and enjoying the weather that's battering the outside of the house. Must to bed. That's a year of blogging. My 50th birthday is all too close and my knees are creaking. Must be all this typing.